William Shakespeare (1564–1616). 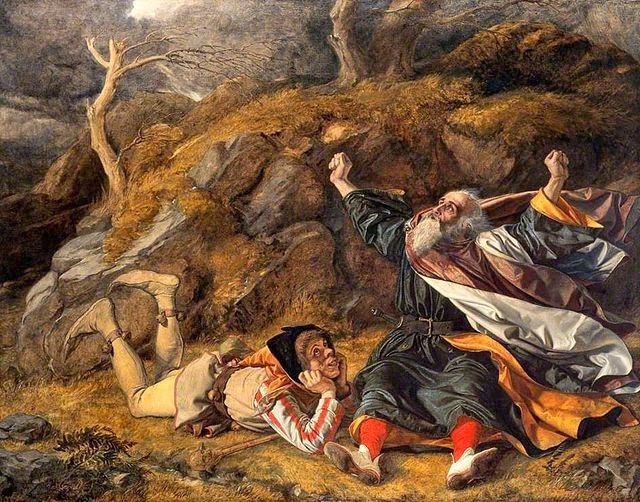 The Tragedy of King Lear. Cordelia, daughter of old King Lear, could not convince her father of her love for him. Afterward, when misfortunes made him accept her aid, he learned too late of her real devotion. Doct. There is means, madam. My mourning and importune 3 tears hath pitied. But love, dear love, and our ag’d father’s right. Soon may I hear and see him! Exeunt. Note 2. Helpful and curative. Reg. But are my brother’s powers set forth? Reg. Himself in person there? Reg. Lord Edmund spake not with your lord at home? Reg. What might import my sister’s letter to him? Osw. I know not, lady. Reg. Faith, he is posted hence on serious matter. Osw. I must needs after him, madam, with my letter. My lady charg’d my duty in this business. Reg. I speak in understanding; y’ are, I know ’t. Than for your lady’s. You may gather more. Osw. Would I could meet him, madam! I should show What party I do follow. Reg. Fare thee well. [Exeunt. Note 1. Induced with much difficulty. Note 5. In her confidence. Glou. When shall I come to the top of that same hill? Edg. You do climb up it now; look, how we labour. Glou. Methinks the ground is even. Glou. So may it be, indeed. Glou. Methinks you’re better spoken. Hangs one that gathers samphire, 3 dreadful trade! Glou. Set me where you stand. Glou. Let go my hand. Edg. Now fare ye well, good sir. Glou. With all my heart. Glou. [Kneeling.] O you mighty gods! Burn itself out. If Edgar live, O bless him! Glou. Away, and let me die. Glou. But have I fallen, or no? Glou. Alack, I have no eyes. Edg. Give me your arm. Up: so. How is ’t? Feel you your legs? You stand. Glou. Too well, too well. Edg. This is above all strangeness. Glou. A poor unfortunate beggar. Horns whelk’d 13 and waved like the enridged sea. Of men’s impossibilities, have preserv’d thee. “The fiend, the fiend!” He led me to that place. Edg. Bear free and patient thoughts. I am the King himself. Edg. O thou side-piercing sight! Glou. I know that voice. Lear. Ha! Goneril, with a white beard! They flatter’d me like a dog, and told me I had the white hairs in my beard ere the black ones were there. To say “ay” and “no” to everything that I said! “Ay” and “no” too was no good divinity. When the rain came to wet me once, and the wind to make me chatter; when the thunder would not peace at my bidding; there I found ’em, there I smelt ’em out. Go to, they are not men o’ their words: they told me I was everything; ’tis a lie, I am not ague-proof. Glou. The trick of that voice I do well remember. Is ’t not the King? To ’t, luxury, 20 pell-mell! for I lack soldiers. Burning, scalding, stench, consumption; fie, fie, fie! pah, pah! Give me an ounce of civet; good apothecary, sweeten my imagination. Glou. O, let me kiss that hand! Lear. I remember thine eyes well enough. Dost thou squiny 24 at me? No, do thy worst, blind Cupid; I’ll not love. Read thou this challenge; mark but the penning of it. Glou. Were all thy letters suns, I could not see. Edg. [Aside.] I would not take this from report. It is; and my heart breaks at it. Glou. What, with the case 25 of eyes? Lear. O, ho, are you there with me? No eyes in your head, nor no money in your purse? Your eyes are in a heavy case, your purse in a light; yet you see how this world goes. Glou. I see it feelingly. Lear. What, art mad? A man may see how this world goes with no eyes. Look with thine ears; see how yond justice rails upon yond simple thief. Hark, in thine ear: change places, and, handy-dandy, which is the justice, which is the thief? Thou has seen a farmer’s dog bark at a beggar? Lear. And the creature run from the cur? There thou mightst behold the great image of authority: a dog’s obey’d in office. None does offend, none, I say, none; I’ll able 27 ’em. To see the things thou dost not. Now, now, now, now. Pull off my boots; harder, harder: so. Edg. O, matter and impertinency 28 mix’d! Thou must be patient; we came crying hither. We wawl and cry. I will preach to thee; mark. Glou. Alack, alack the day! Gent. You shall have anything. [Ay, and laying autumn’s dust. Gent. You are a royal one, and we obey you. Lear. Then there’s life in ’t. Come, an you get it, you shall get it by running. Sa, sa, sa, sa. Exit [running; Attendants follow]. Gent. Sir, speed you: what’s your will? Edg. Do you hear aught, sir, of a battle toward? How near’s the other army? Edg. I thank you, sir; that’s all. Her army is mov’d on. Exit. Edg. I thank you, sir. Edg. Well pray you, father. Glou. Now, good sir, what are you? I’ll lead you to some biding. Osw. A proclaim’d prize! Most happy! Edg. ’Chill 37 not let go, zir, without vurther ’casion. Osw. Let go, slave, or thou diest! Edg. Good gentleman, go your gait, and let poor volk pass. An ’chud 38 ha’ bin zwagger’d out of my life, ’t would not ha’bin zo long as ’tis by a vortnight. Nay, come not near th’ old man; keep out, ’che vor ye, 39 or Ise try whether your costard 40 or my ballow 41 be the harder. ’Chill be plain with you. Osw. Slave, thou hast slain me. Villain, take my purse. Upon 43 the English party. O, untimely death! Glou. What, is he dead? Edg. Sit you down, father; rest you. He had no other death’s-man. Let us see. (Reads the letter.) “Let our reciprocal vows be rememb’red. You have many opportunities to cut him off; if your will want not, time and place will be fruitfully offer’d. There is nothing done, if he return the conqueror; then am I the prisoner, and his bed my gaol; from the loathed warmth whereof deliver me, and supply the place for your labour. So should my thoughts be sever’d from my griefs, Drum afar off. Edg. Give me your hand. Far off, methinks, I hear the beaten drum. Come, father, I’ll bestow 48 you with a friend. Exeunt. Note 3. A herb used for pickling. Note 5. Refuse, worthless part. Note 9. End to end. Note 21. Probably, hair ornaments. Note 23. Lusty with feeding. Note 28. Sense and nonsense. Note 30. To the test. Note 34. The sight of the main body is hourly expected. Note 38. If I could. Note 39. I warn you. Note 46. Whose death was plotted.